For more than two decades, TCAS has been retained in cases involving LNAPLs. We have considerable experience in establishing the source(s), age and characteristics of LNAPL. Additionally, we have performed LNAPL risk assessments on behalf of individuals, private industry and government agencies (New York State DEC, New Jersey DEC and others). We have offered unbiased toxicological opinions on behalf of both defendants and plaintiffs, based on objective and analytical evidence. We are experienced with the methodologies required to produce reports and demonstratives suitable for peer review or for presentation in court. We work closely with clients and attorneys to ensure that all pertinent analytical and toxicological issues related to LNAPL are addressed thoroughly in our reports and in expert testimony. LNAPL (Light Non-Aqueous Phase Liquid) refers to a group of organic chemical substances (often petroleum) which are relatively insoluble and less dense than water. These characteristics cause them to form a layer at or near the surface of a water table. LNAPL can pose significant environmental and toxicological issues with respect to both short- and long-term exposures. LNAPL analyses can involve aspects of analytical and reconstructive chemistry as well as modeling of liquid behavior, migration and fate. Consequently, scientifically credible LNAPL analyses frequently require the combined efforts of a qualified hydrogeologist working in concert with an analytical toxicologist. LNAPL may float on water or co-exist with water in the pore network within an aquifer. 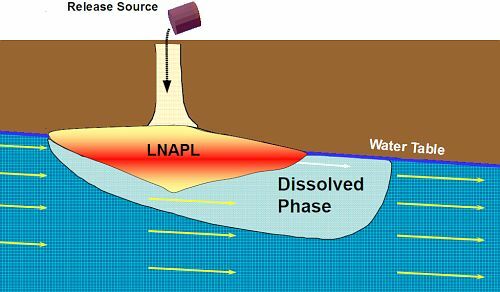 LNAPL only partially fills the aquifer pore space. LNAPL saturations decrease with depth until water fills all the pores. The degree of LNAPL saturation is dependent upon the soil and fluid properties, site history and the volume of LNAPL released. The variation of LNAPL saturation in soil with depth can generally be predicted. The total free LNAPL volume, migration potential and recoverable volume can also be predicted. LNAPL analytical toxicology is a complex subject owing to the wide range of constituent chemicals that may be present. LNAPL can contain any of a variety of substances such as gasoline, diesel, crude or waste oil and other types of petroleum-based fuels. LNAPLs can also include more toxic chemicals such as benzene, toluene and tetraethyl lead. A state-of-the-art LNAPL analysis involves characterization, source and age determination supported by a compilation of laboratory results of free product and water samples. Such a compilation can include P-I-A-N-O analysis (Paraffins, Isoparaffins, Aromatics, Naphthenes and Olefins), high-temperature distillation and other specialized laboratory methods. Constituent chemicals are assessed according to concentrations and composition. LNAPL laboratory analyses can includes tests for chemicals such as methyl-t-butyl ether (MTBE), ethyl-t-butyl ether (ETBE), diisopropyl-ether (DIPE), t-amyl-methyl ether (TAME), t-butyl alcohol (TBA), ethanol, organic lead additives, manganese additives (MMT) and others. Ultimately, TCAS has been highly successful in the identification and characterization of LNAPL including its source and age. LNAPL laying above the water table tends to move slowly over time, changing location, concentration and composition as different chemicals age and dissociate. Only a qualified hydrologist can accurately assess the behavior, migration, transport and fate of underground LNAPL over time. Expert toxicologists and hydrologists work closely together to characterize the petroleum and determine its source and age. Normally, the hydrological model is supported by water and free product samples collected at multiple depths and in multiple locations within the area of concern (AOC). Combining sample results with the hydrological model creates a realistic picture of the scope of LNAPL contamination — an important requirement for an impartial toxicological risk assessment. Some constituent chemicals in LNAPL possess sufficient volatility to produce soil vapors which may infiltrate into basements and other subterranean structures. 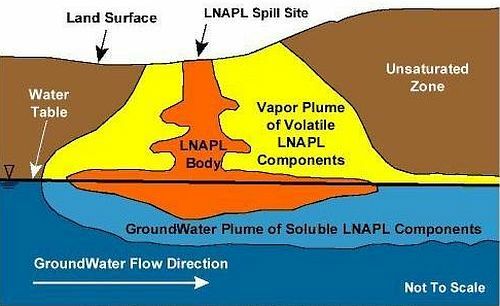 This vapor intrusion can occur when transformed LNAPL liquids vaporize and migrate through soil layers over time. Vapor concentrations can be detected near the ground surface as well using specialized soil gas monitoring techniques. In cases where vapors are present, the scope of LNAPL vapor inhalation must also be determined as inhalatlon is an additive component in a toxicological risk assessment. Characterization and source identification of LNAPL contamination presents as a complex and challenging field of study. Identification of the composition, source and age of LNAPL contamination is central to identification of the responsible party. A hydrogeological model of LNAPL contamination, validated by free product soil and water samples and coupled with state-of-the-art analytical methodology, greatly assists in the creation of an objective source identification. The same analytical methodology can often identify the LNAPL source(s) with reasonable scientific certainty, particularly if free product soil and water samples are collected over time. LNAPL contaminants can sometimes be segregated and type-matched to specific sources by virtue of their composition, additives and documented historical factors. For example, if a chemical compound found in a LNAPL mixture was manufactured only for a specific period of time or was in use only by a particular, known source, this information can help to eliminate other candidates as sources of origin. Great attention to detail and strict compliance with generally-recognized, peer-reviewed analytical methodologies are required as weight-of-evidence (WOE) determinations can greatly impact the outcome of any case involving LNAPL. From a forensic toxicological perspective, scientifically credible determination of the age and source of LNAPL contamination is critical with respect to liability. Since LNAPLs are lighter than water, they frequently tend to form a layer on top of the water over time (and may subsequently migrate). Compounds with densities greater than that of water (such as TCE) can form dense non-aqueous phase layers known as DNAPL. LNAPL layer(s) can persist over long periods of time, even decades. There are numerous locations in the US where industrial LNAPL contamination has created underground layers of petroleum products of various ages floating on top of underground water tables and reservoirs. TCAS has assessed cases in which LNAPL was suspended on residential water tables as a consequence of contamination from multiple sources over many decades. Forensic toxicological analyses in such cases involved the use of specific scientific methods to identify the characteristics, additives, source and age of the LNAPL plume. These are all critical issues with respect to matters of liability. It should be pointed out that LNAPL contamination remediation is seldom a short-term project. Toxicologists may work closely with legal personnel to set achievable goals consistent with regulatory requirements and human health risk assessments, both in realistic timeframes and within reasonable budgets. However, LNAPL contamination imposes some unique, practical considerations. For example, LNAPL is hydraulically recoverable if the rate of recovery (using conventional hydraulic methods such as pumping, skimming, etc.) is technically and economically feasible at the contamination site and if applying such recovery methods does not introduce new health hazards. However, only some sites will warrant such an investment in recovery apparatus and personnel. Similarly, a toxicological assessment can identify health-based considerations which, in turn, may suggest specific approaches for medical monitoring and treating residents during and after remediation. U.S. EPA publications and state regulatory guidance can assist decision-makers with making good choices and addressing health-based factors most appropriate to the impacted community. An objective LNAPL toxicological assessment involves compositional chemistry analyses designed to assess source and age, followed by a comprehensive health risk assessment based on a quantitative evaluation of water ingestion, vapor intrusion and other factors. It is highly recommended that in view of the scope of potential liabilities associated with LNAPL, any individual, company or government agency engaged in LNAPL litigation matters always retain an experienced expert toxicologist and hydrologist. TCAS has performed numerous LNAPL assessments and provided objective reports as well as expert opinions and expert witness consults for many types of LNAPL and DNAPL contamination. U.S. Environmental Protection Agency, "Light Non-Aqueous Phase Liquids (LNAPLs),"
U.S. Environmental Protection Agency, "A Decision-Making Framework for Cleanup of Sites Impacted With Light Non-Aqueous Phase Liquid (LNAPL)"
Massachusetts Department of Environmental Protection, "Updated Petroleum Hydrocarbon Fraction Toxicity Values for the VPH/EPH/APH Methodology," November 2003, Bureau of Waste Site Cleanup. Louisiana Department of Environmental Quality, "Risk Evaluation Corrective Action Program (RECAP)," 2003. State of Ohio, "Guidance for Assessing Petroleum Hydrocarbons in Soil," September 22, 2004, Number DERR-00-DI-033. ATSDR, Division of Toxicology and Environmental Medicine, "Public Health Statement for Total Petroleum Hydrocarbons (TPH)," September, 1999. Adapted from U.S. EPA, "Understanding Light Non-Aqueous Phase Liquid (LNAPL) Behavior in Soil"
"LNAPL analyses involve aspects of both forensic and analytical toxicology. Unbiased toxicological opinions, strict attention to detail and compliance with generally-recognized, peer-reviewed methodologies are essential in any case involving LNAPL." This is an informational and instructional website devoted to toxicology. It presents both original and edited public-domain content compiled as a useful educational resource. References and footnotes have been included wherever possible and image sources have been cited where appropriate. Although most pages can be printed or downloaded as PDF files (and we encourage you to make constructive use of our information), this website is copyrighted and material may only be reproduced and/or distributed with prior permission from TCAS, LLC.